"Crestwoods Tex The Dog Formerly Known As Prince" was born on June 9, 2009 and became a member of the Schuster family in January 2010. 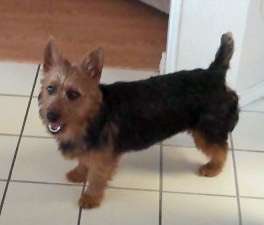 Tex is a Blue and Tan Australian Terrier. Tex's name was derived as follows: "Crestwoods" identifies and honors the breeder's kennel name. "Tex" is a very common dog name in Texas. During his first seven months of life he was called "Prince" while living with the breeder. Therefore, after Tex was renamed by his new owners, he was the dog that was formerly known as Prince. 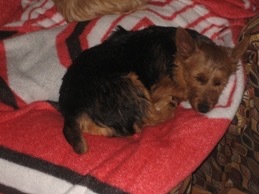 Because he is an Australian Terrier, he loves to run, bite squeaky tennis balls, and jump on his family's laps. He and his new sister, Dot, are getting along fine. Being a puppy, Dot has a lot of energy and sometimes annoys Tex with her rough play. Click here to go to Tex’s original webpage.